Design is hip these days. 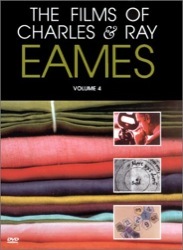 Long before it was hip, Charles and Ray Eames pioneered the design approach to life. Nowhere is their legacy so well represented as in this single-volume exhibit covering every project in their life’s work. 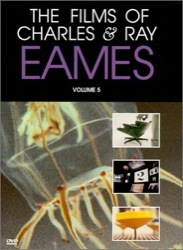 The Eameses were probably the tech-friendliest designers ever, without ever being hi-tech. 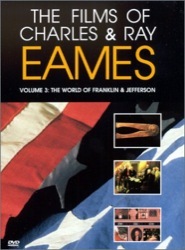 They certainly were the first on the frontiers of exhibit, museum, and informational film design. 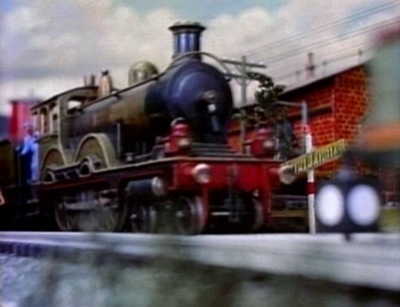 They designed types of things that had never been designed before. 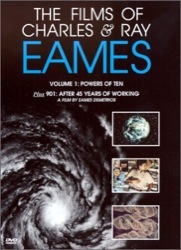 This book, together with the multi-volume DVD of their brilliant short films, makes it clear that the Eames pursued their passions first. As design goes commercial in a big way, theirs is a mighty inspiring stance. This is the most comprehensive and graphic record of not only their work (3,500 images) but perhaps of any designer’s work. 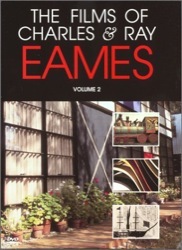 I use this book to expand my notions of what can be designed. Young viewer watching a Mathematica Peep Show. 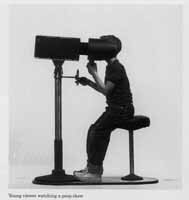 These films were called “peep shows” because they were first shown in devices designed to accommodate one viewer. 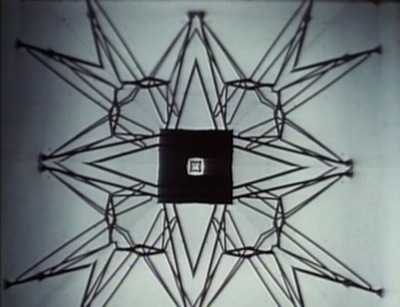 They were intended for a short attention span; each two-minute film explored one mathematical concept and could be seen as many times as a viewer needed to understand the idea. 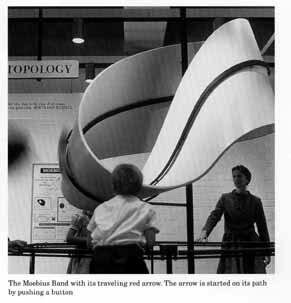 The Moebius Band with its traveling red arrow. 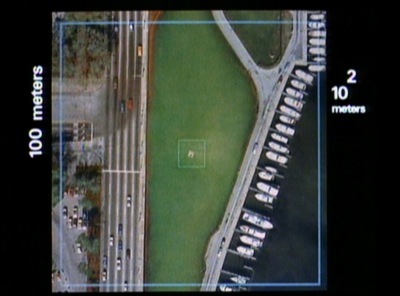 The arrow is started on its path by pushing a button. 1961. 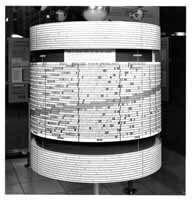 A large drum made in the Eames Office demonstrated how calendar years and feast days are determined. The drum was divided into horizontal strips, each of which represented one solar year, with the succession of days and full moons marked. The drum charted certain seasonal celebrations–Christian Easter, Orthodox Easter, Passover, Rosh Hashanah, Ramadan, Islamic New Year, winter and summer solstices, vernal and autumnal equinoxes, Thanksgiving and leap-year day–and showed how their dates change from year to year.